… So humans won’t play a significant role in the spreading of intelligence across the cosmos. But that’s OK. Don’t think of humans as the crown of creation. Instead view human civilization as part of a much grander scheme, an important step (but not the last one) on the path of the universe towards higher complexity. Now it seems ready to take its next step, a step comparable to the invention of life itself over 3.5 billion years ago. As we welcome our computer overlords, we might recall that it was on this date in 1930 that Henry W. Jeffries invented the Rotolactor. 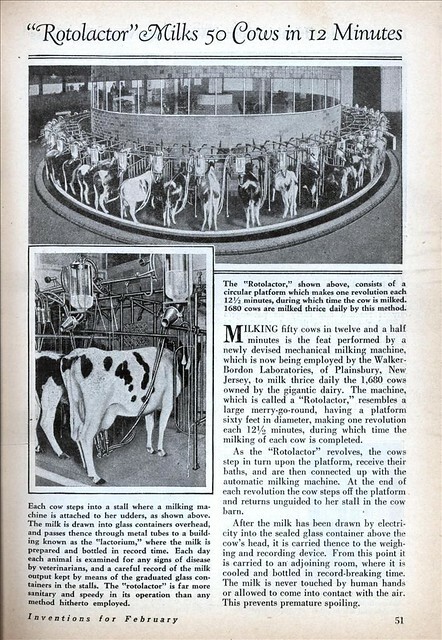 Housed in the Lactorium of the Walker Gordon Laboratory Company, Inc., at Plainsboro, N.J., it was a 50-stall revolving platform that enabled the milking of 1,680 cows in seven hours by rotating them into position with the milking machines. A spiffy version of the Rotolactor, displayed at the 1939 New York World’s Fair in the Borden building as part of the “Dairy World of Tomorrow,” was one of the most popular attractions in the Fair’s Food Zone. 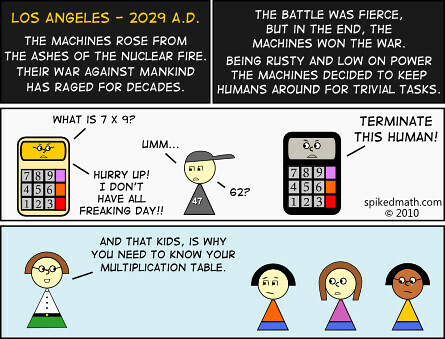 On a more serious note… many are skeptical of “the Singularity”– the hypothetical point at which technological progress will have accelerated so much that the future becomes fundamentally unpredictable and qualitatively different from what’s gone before (click here for a transcript of the talk by Vernor Vinge that launched the concept, and here for a peek at what’s become of Vernor’s initial thinking). But even those with doubts (among whom your correspondent numbers) acknowledge that technology is re-weaving the very fabric of life. 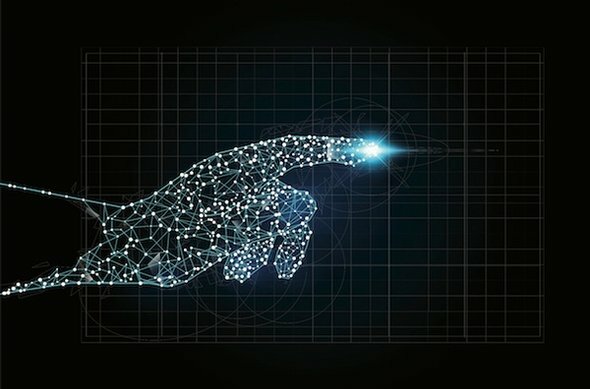 Readers interested in a better understanding of what’s afoot and where it might lead will appreciate Kevin Kelly’s What Technology Wants (and the continuing discussion on Kevin’s site). 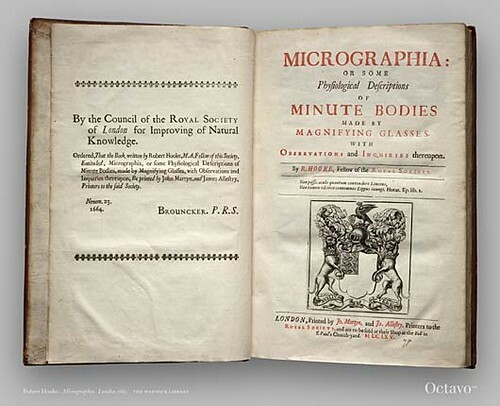 As we re-set our multiplication tables, we might recall that it was on this date in 1664 that natural philosopher, architect and pioneer of the Scientific Revolution Robert Hooke showed an advance copy of his book Micrographia— a chronicle of Hooke’s observations through various lens– to members of the Royal Society. The volume (which coined the word “cell” in a biological context) went on to become the first scientific best-seller, and inspired broad interest in the new science of microscopy. UPDATE: Reader JR notes that the image above is of an edition of Micrographia dated 1665. Indeed, while (per the almanac entry above) the text was previewed to the Royal Society in 1664 (to wit the letter, verso), the book wasn’t published until September, 1665. JR remarks as well that Micrographia is in English (while most scientific books of that time were still in Latin)– a fact that no doubt contributed to its best-seller status.